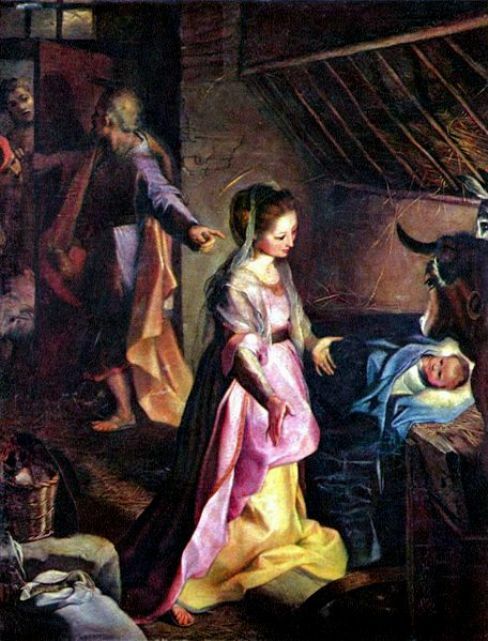 Paintings of the birth of Jesus may show him born in an animal’s storeroom to an ordinary peasant woman, or ignore historical fact and show a richly dressed woman with a newborn king. Both versions are right: Jesus was one of us, born to ordinary parents, but he was also King of Kings, born to glory. 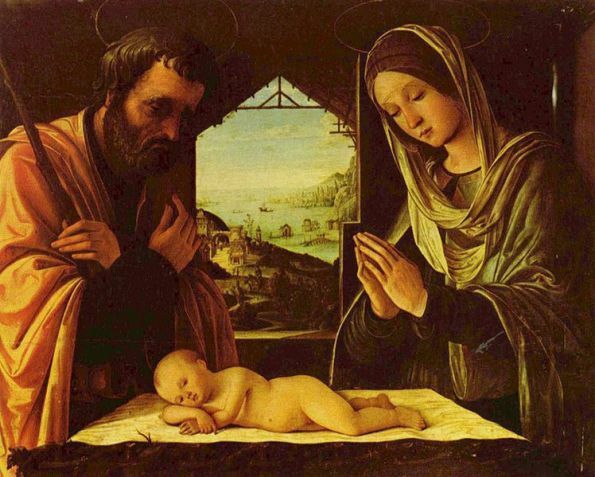 Joseph, sometimes as a young man but often an older man who would not infringe on Mary’s virginity. How sweet this painting is. 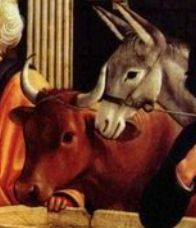 Mary, the new mother, is unable to drag her gaze away from the miracle that is her baby; Joseph, the elated father, pulling visitors in to see his child, surely the most wonderful thing in the universe; and the calm ox and donkey, who look as if they have seen it all before. Barocci used pastel colours to great effect. His paintings were subtle, gentle, engaging. The composition of this paintings is also interesting: the newborn baby is at the far right, almost outside the picture, but everything directs our eye towards it: Joseph’s pointing hand, Mary’s face and hands, the animals’ gaze. The new Eve (Mary) has discarded the half-rotten apple, symbol of Eve’s disgrace. Her son will save the world lost by Adam and Eve. In the background, through a window, sit two Carthusian monks pointing to the monastery that will house this magnificent painting – the Certosa di Pavia in Lombardy. 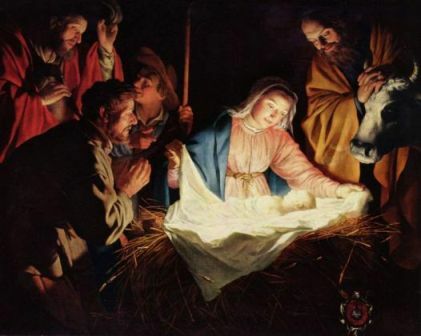 Radiant light emanates from the newborn child, illuminating everything around it – Jesus is the Light of the World. It is also a symbol of the message this baby will bring to the world. 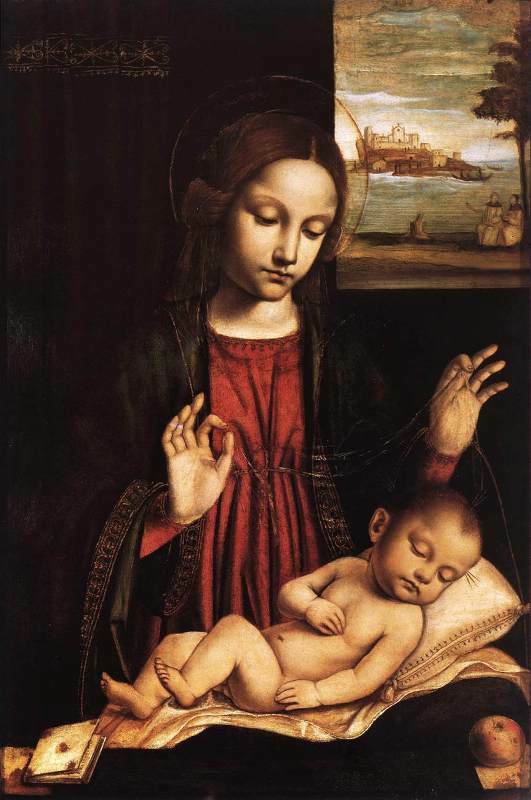 But Mary, do cover up the baby please – it’s winter, after all. In the bottom righ-hand corner of the painting is a device that looks like a crest of arms, or insignia. This is probably the crest of arms of the person/family who commissioned the painting from van Honthorst. Can anyone tell me the name of this patron? The best of the early Renaissance painters concentrated on exquisite decoration; they were not interested in graphic portrayal of real life. 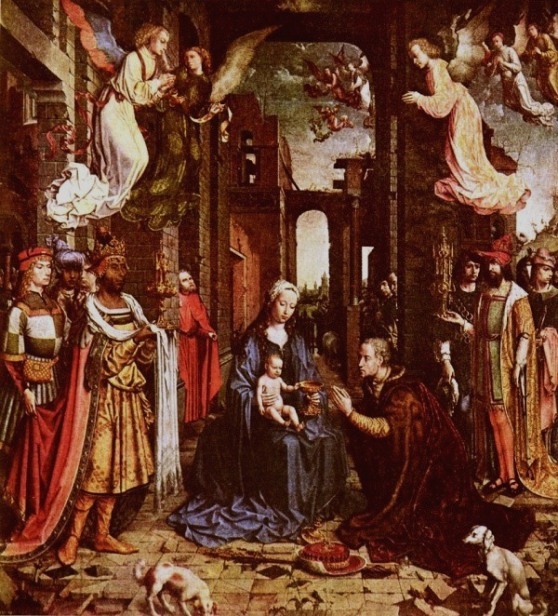 There are many figures and components in Mabuse’s ‘Adoration of the Kings’, but each one is necessary to the whole. The artist obviously worked it out in great detail before he began to paint – indeed, the actual application of paint was only a last step in the process. Every figure and object emphasises the importance of the Madonna and the Infant Jesus – they have become the center of the universe. But the real world is there too, in the presence of two small (but aristocratic) dogs. The Madonna has the facial delicacy which was a feature of Costa’s paintings. Am I alone in noting some similarity between this Madonna and the women painted by Leonardo da Vinci? 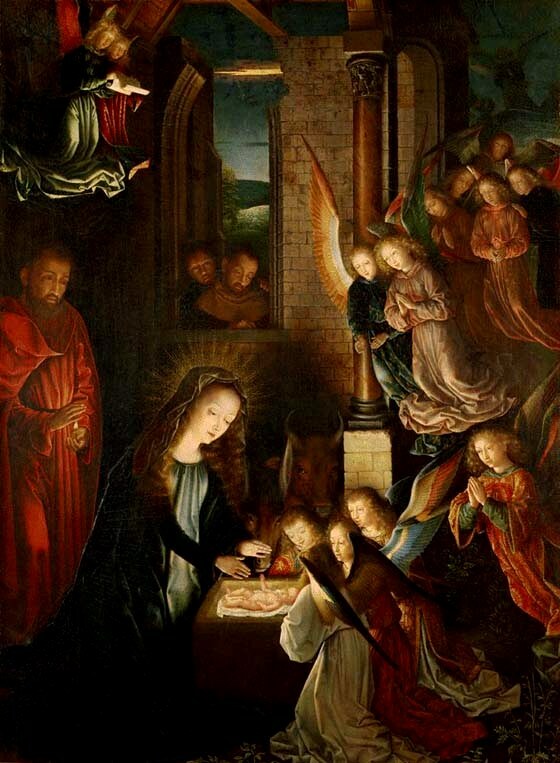 Note the pose of the Infant Jesus; he is usually shown lying on his back looking upwards at his mother. Discarding this formula, Costa has a drowsy Infant looking outwards, towards the viewer. What a relaxed little baby! Joseph looks glum – or is it merely his drooping moustache that makes him seem so? Art critics have called Gerard David’s paintings conservative, even bland, and who am I to argue? But he paints the most wonderful angels – glorious creatures, truly celestial. See their exquisite wings in his ‘Annunciation’ in the thumbnail at right. If this is ‘conservative’, give me more. Bruges, as the headquarters of Netherlands art, was losing its importance to Antwerp when this painting was done. David was the dean of the painters’ guild, and also the last great master from this town. His paintings, beautiful as they are, have a certain melancholy, a gentle sadness.